Will Kenya's Court Ruling On Poll Results Set Precedent in Region? 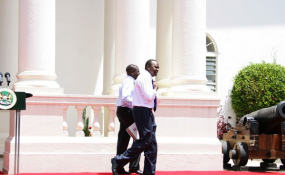 President Uhuru Kenyatta (right) with his Deputy William Ruto (file photo). Tough-talking President Uhuru Kenyatta and his deputy William Ruto on Saturday hit out at the Supreme Court, questioning the reasoning of their nullification of their win. The Jubilee duo also threatened to "deal with" the Judiciary should they be re-elected in an election the Supreme Court on Friday said should happen within 60 days after the ruling. "Even if you are so stupid, ask yourself something: The people elected an MCA, results were transmitted, and no one asked questions. Those of MPs and senators were transmitted, and no one asked questions and they have been sworn in. "Those of governors were transmitted, no one asked questions. Now how do four people and wake up and say there was a technicality in the transmission of the results of the President only? How?" asked President Kenyatta at State House when he met Jubilee Party and allied parties governors and members of the county assemblies. A visibly angry President Kenyatta then threatened to deal with the Supreme Court judges if he is re-elected. "We shall revisit this thing. We clearly have a problem. Who even elected you? Were you? We have a problem and we must fix it," he said. He insisted that though he respects the ruling of the apex court and was ready for an election, the judgment in itself, he argued, was wrong both in principle and fact. "The Supreme Court sat and decided that they are the ones with a bigger power than the 15 million Kenyans who woke up, queued in lines, and voted for their preferred presidential candidate. As a Supreme Court, they cannot annul the wishes of the people. And we will revisit this thing," he said. He went on: "Look me in the eye and see that me being desirous of people living in peace does not in any mean I am coward. We are not." Mr Ruto was less subtle in his comments. "When this is done, we shall interrogate everything, how a Supreme Court overturned the will of Kenyans on the basis of things that have nothing to do with how they voted, on some technicality. Hiyo ni upuzi (That is stupidity)," said DP Ruto. He accused the Raila Odinga-led opposition, which filed and won the petition, of an attempt to use the courts to push for a coalition government famously known in Kenya as "nusu mkate (Half a loaf). "We want to tell you this: We won the election fair and square. And we are unapologetic about it. We will not succumb to any intimidation from the court to forego our win. We won," said Mr Ruto. He questioned the powers of the Supreme Court to annul the elections. "It is not the Supreme Court that is supreme. It is the Kenyan people that are," said Mr Ruto. The Jubilee duo said they were ready for a repeat poll, and urged the Independent Electoral and Boundaries Commission to announce the date of the next poll. They also vowed to block any attempts by Mr Odinga to change the commission. "We have been down this road before. This time, we will not. We have no time to change the IEBC. You accepted the results of the other elective seats in an election that was managed by this same IEBC. Get ready for an election, and Raila, see you at the ballot," said President Kenyatta.